Gas Prices Pinch, And The President Feels The Pain It doesn't take much prompting to get Obama started on the subject of gas prices. The president is quick to talk about the challenges American drivers face, but he's offering little in the way of short-term relief. 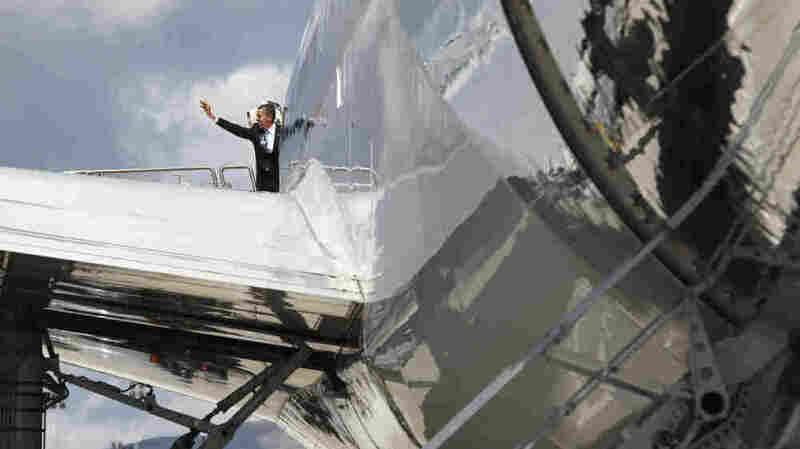 President Barack Obama waves from Air Force One before taking off from Reno, Nev., Thursday. Gas prices were on the program for President Obama this week. He visited Virginia, Nevada and California, highlighting the cost of gasoline among other hardships the American people are dealing with. The president offered little in the way of short-term relief, though. It didn't take any prompting from the audience to get Obama started on the subject of gas prices. He brought it up himself, again and again — as if to say no matter how far removed Washington may seem, he understands the challenges American drivers face. "I admit Secret Service doesn't let me fill up my own tank now. But I remember before I was president, the last time gas prices went up this high," he said. "It's tough." In fact, gasoline prices hit their all-time peak in the summer of 2008, when Obama was running for president and "Drill, Baby, Drill" became a rallying cry for his Republican opponents. Back then, Obama argued there was no quick fix for $4-a-gallon gasoline, and he made that point again this week. "Every time gas prices go up like this, like clockwork, suddenly politicians look around and they discover high gas prices," he said. "And they're shocked. And they get in front of TV and say we've got a three-point plan to bring gas prices down to $2 a gallon. Then when gas prices go down, nothing ever happens." Obama himself has had little success in pushing Congress to adopt a comprehensive energy strategy. He has managed to raise fuel economy standards and boost investment in electric cars, but neither of those is a quick antidote to high gas prices. So Thursday, the president added a new message, announcing the Justice Department has teamed up with state and federal regulators to root out any manipulation in the oil and gasoline markets. "We're going to make sure that nobody's taking advantage of American consumers for their own short-term gain," he said. In 2006, NPR's Scott Horsley reported on a similar attempt by President George W. Bush to rein in soaring gas prices. This search for a villain to blame for high pump prices has a familiar ring to it. No wonder, former President George W. Bush called for a similar investigation almost five years ago, when the price of gas neared $3 a gallon. "Americans understand by and large the price of crude oil is going up. And that the prices are going up," Bush said back then. "But what they don't want and will not accept is manipulation of the market. And neither will I." Back then, in April of 2006, John Seesel of the Federal Trade Commission said the energy business probably gets more scrutiny than any other industry. So much attention, that the federal government is investigating gasoline prices pretty much all the time. "Our staff looks very carefully to see if there is some kind of anti-competitive conduct going on which might explain the price," he said. "And we have found in virtually every situation, really every situation, that market forces are generally causing those situations." But even though they almost never find any wrongdoing, Seesel said this week that investigators will keep the oil and gasoline industries under a microscope. Meanwhile, Obama acknowledged that as long as American drivers depend so heavily on gasoline to get around, they will be vulnerable to spikes in the price of oil. "The truth is, the only real solution to helping families at the pump in the medium- and long-term is clean energy," he said. "That's how we'll save families money. That's how we'll reduce our dependence on foreign oil. We've got to develop new technologies to lessen our reliance on fuel that is finite and that we've got to import from other countries." And none of that is likely to happen before this summer's driving season — or the 2012 election.